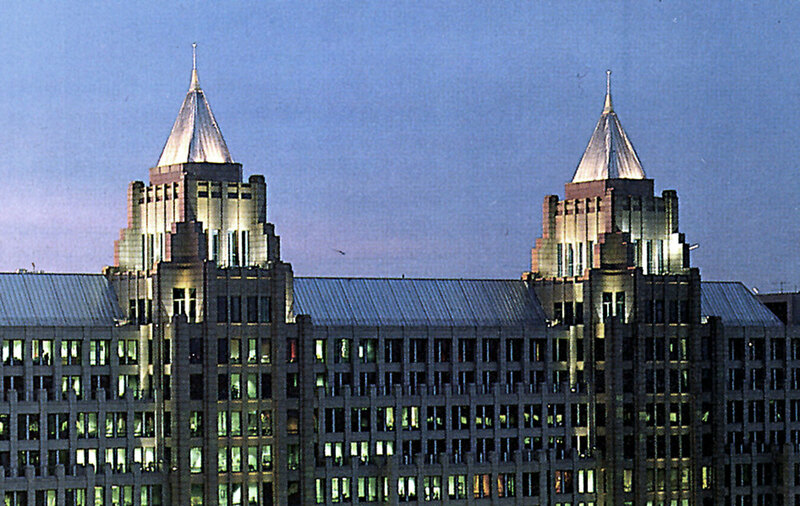 The most striking aspect of One Franklin Square is its twin towers, which identify the building from afar and provide the predominantly low-rise city with a new landmark. The 1.1 million square foot office tower was aligned with Franklin Square, a former Civil War encampment ground, which forms the building's front yard across K Street, one of Washington's major commercial arteries. Specific design cues were derived from Franklin Square's two venerable next-door neighbors to the west: the Beaux-Arts Hamilton Hotel and the 1926 Moorish-style Almas Temple, which was moved slightly to accommodate One Franklin Square and restored as part of the project.